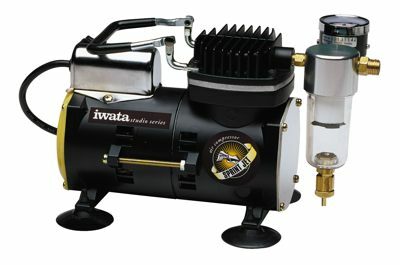 The Sprint Jet compressor is ideal for the occasional and professional artist doing general airbrush applications. It’s powerful, compact, reliable and quiet. The zero-maintenance, oil-less piston air compressor has a 1/8hp motor that can produce a working pressure from 1psi to 35psi, and the moisture filter also prevents pulsation. A mounted air-pressure gauge and bleed-vavle airflow adjustment allow fine control over the air pressure. The included high-strength polyurethane hose fits all Iwata airbrushes.